Duncan Jones' Moon was an unalloyed pleasure when it was released this summer amidst all the chest thumping from the bigger blockbusters. It scored highly with its great subtlety and integrity whilst the other films bombastically touted their wares on the screen. I'm not going to repeat my full analysis, which you can find here, but suffice it to say this science fiction gem makes a very successful transfer to Blu Ray. The films claustrophobia is heightened by home viewing and I'd recommend watching this on a big monitor in a darkened or dimly lit room. It will add to the atmosphere. 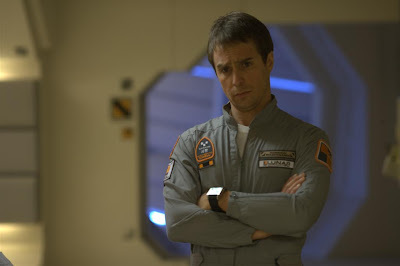 Central to the success of this film is Sam Rockwell's performance. He's quite brilliant in this and after watching the special features you'll come away with a greater appreciation of how tough it must have been to be acting with yourself. Duncan Jones, the director, is going to be a major talent and clearly loves the science fiction films he grew up with and it's interesting to note that he's already preparing a sequel. The picture quality of the 2.39:1 transfer is excellent and is clean, spotless and demonstrates good contrast and flesh tones. It copes admirably well with the sudden shift from very dark, shadowy scenes to brightly lit moments set in the base. Detail is good, often superb in the effects sequences, but there is some overall softness to the image occasionally. It captures perfectly the homage to classic science fiction films such as Alien and Outland with strong blacks for the moon sequences and excellent contrast and detail where necessary for the interiors. You'll certainly pick up far more detail on the sets here than you would with a theatrical screening. The 5.1 DTS HD Master audio is more than adequate for the transfer. It's not a film chock full of explosions and low frequency effects but it presents the dialogue very crisply and highlights Clint Mansell's wonderful score very well. There's a very jolly commentary with Jones, director of photography Gary Shaw, concept designer Gavin Rothery and production designer Tony Noble that has no dead air in at all. All four men throw in lots of behind the scenes information, anecdotes and irreverent humour. The overall feeling you get from this is that for everyone working on the film it certainly was a labour of love and everything you see was pulled together with very little money using often very rudimentary methods. The second commentary is with Duncan Jones and producer Stuart Fenegan. A much more sober, slower affair that digs into the themes and characters of the story with more easily digestible production information. Jones brings up the NASA screening and discusses the science behind the Helium 3 mining. It's full of great observations about the science and technical accuracy of the film, picking up on very small details that Jones obviously obsesses over. A 16 minute behind the scenes featurette exploring the challenges of making the film. Interviews with Duncan Jones and Sam Rockwell describe the rigours of shooting and timing the filming of split screen sequences and delineating the two versions of Sam. It also looks at the building of and filming on the self-contained moon base set. Jones also discusses the use of models as opposed to using CGI for some of the 400 effects sequences. A good summation of the experience. An 11 minute look at Cinesite's year long work on the film. This covers the motion control work to create the split screen images for the clones of Sam. Lots of separate plates are shown and mixed to demonstrate the process. There's also a look at the stunt work and how they digitally replaced the stunt man's head! Gerty, the robot, was also a mix of CGI and physical props and this looks at how these shots were mixed, matched and graded. Finally, this featurette spotlights the the rovers and lunarscapes, all practical models, mixed with digital mattes and discusses the HDRI mapping of the set. A 20 minute Q&A at the space centre Houston. Jones introduces the film, explaining it as an homage to the films he grew up with including Silent Running and Outland. He goes on to answer questions and offers that there will be a sequel based in a future Berlin. He answers several questions about how the film was set up and questions about the clones lifespan. A bit choppy but still interesting. An 11 minute piece featuring an introduction by Jones and a post screening Q&A to the film at the Sundance Film Festival. Again, some development, technical and casting questions to Jones, Rockwell and the producers, including Trudie Styler. All accomplished with great humility and humour. The Moon trailer plus a Sony Blu Ray promo, trailers for 2012 and Ghostbusters. 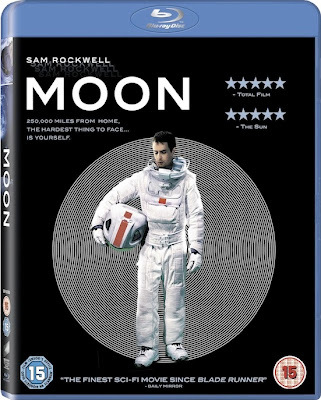 Take a look at the recently launched Sony website to accompany the DVD and Blu Ray release of Moon. Lots of video, galleries and a competition to enter. Thanks to greenroom@momentum PR for their support. Cathode Ray Tube has one copy of the Blu Ray of 'Moon' to give away. This competition is courtesy of Sony Pictures. This competition is open to residents of the UK only over the age of 15, but not to employees of Sony Pictures Releasing or their agents. The winners will be the first entry drawn at random. The winner will be contacted by email.The Blu Ray will be posted within 5 days of the competition closing (unless delayed by postal strikes). 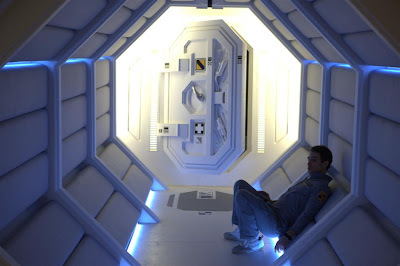 Question: What's the name of the studio where Duncan Jones shot 'Moon'? Congratulations to the winners of our last competition, to win two copies of Angels And Demons on Blu Ray, Liz Stephenson and Mark Oakley.